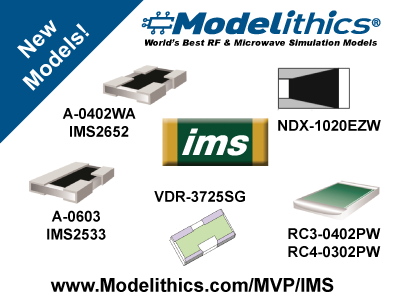 Tampa, Florida and Portsmouth, Rhode Island (January 31, 2019) – Modelithics and International Manufacturing Services (IMS) have completed the development of eight new broadband Microwave Global Models™ for IMS attenuator and resistor families. The models were developed through the Modelithics Vendor Partner (MVP) Program under a 6-year collaboration plan recently established between Modelithics and IMS. IMS is a Sponsoring Modelithics Vendor Partner (MVP) and as part of this program, is sponsoring FREE 90-day trials of all available Modelithics models for IMS components. For more information about the new models, and to request the free trial, visit the IMS landing page on the Modelithics website: www.Modelithics.com/MVP/IMS. Modelithics, Inc. (www.Modelithics.com) was formed in 2001 to address the industry-wide need for high-accuracy RF and microwave active and passive simulation models for use in Electronic Design Automation (EDA). Modelithics’ premium product is the Modelithics® COMPLETE Library, which includes the CLR Library™, containing measurement-based Microwave Global Models™ for a multitude of commercially-available passive component families, the NLD Library™ (non-linear diode models) the NLT Library™ (non-linear transistor models), and the SLC Library™ (system level component models). The new Modelithics COMPLETE+3D component library is also available to enable full-wave EM simulations of components, connectors and packages within ANSYS HFSS. Modelithics’ services also address a wide range of custom RF and microwave measurement and modeling needs. Modelithics® is a registered trademark of Modelithics, Inc. Microwave Global Models™, CLR Library™, NLD Library™, NLT Library™, and the SLC Library™ are also trademarks of Modelithics, Inc. The Modelithics Vendor Partner Program allows for collaboration and open communication during the development of advanced data sets and models for commercially available microwave components and devices, with flexible sponsorship and distribution arrangements for the resulting data and models. An example of such an arrangement is the Modelithics Qorvo GaN Library, a fully sponsored library distributed for free by Modelithics under sponsorship of Qorvo®.